Advice about Trump's wall from one property owner to another: When the government comes calling on the Mexico border, "Don't sign anything"
To south Texas landowners in danger of losing property to President Donald Trump’s wall between Mexico and the United States, Jose Palomino has this advice: Get a good lawyer. He did not a decade ago when President George W. Bush was erecting barriers along the border. Where his house in San Benito in Cameron County once had a nice view of trees and grass, it now looks out on a high fence, about 20 feet tall, on a piece of property the federal government condemned, he said. "It's like a big prison cell," he said. Before work begins on Trump's wall, the Texas Civil Rights Project is gearing up for the fight by getting in touch with every landowner along the border in south Texas to offer help. This time the organization wants to make sure that they are represented by lawyers. North Texas contractors are among hundreds submitting proposals to build President Donald Trump's proposed border wall. "Even if they are in favor of the wall, we'll represent them," said Efrén C. Olivares, the project's racial and economic justice director. Landowners do not have to take the first price offered to them, and if the landowner and the government cannot agree on compensation, the landowner can request a jury trial. There are more than 1,000 property owners on the Texas-Mexico border, Olivares said. Imagine adding dozens or potentially hundreds of new lawsuits to the federal courts, he said. "Just by the sheer volume of cases that the government will need to bring, it's going to slow the process such that perhaps the political winds will change and maybe there's no funding for it after the mid-term elections or maybe there's a new president," he said. Even if the federal government does eventually take the land through eminent domain -- and the government can take possession before lawsuits are settled -- lawyers can win property owners a better price. "As a rule, I would say government tends to under-compensate landowners and it's a concerted effort to do so," said Jim Burling, a vice president of litigation for the Pacific Legal Foundation, founded by members of former President Ronald Reagan's senior staff to litigate for property rights, limited government and free enterprise. Because of the terrain, a wall cannot run entirely along the Mexico border, and property will be cut into portions, he said. What about land still in the United States but on the wrong side of the wall? Those kinds of questions will prompt even more lawsuits, he predicted. "It seems to be an imperative of governments everywhere, Democratic administrations, Republican administrations, state government, local government, they all want to acquire property for the public good and pay the least amount possible for it," he said. “Now the Constitution says just compensation must be paid, and that means compensation that should just, not just as little as you can get way with." 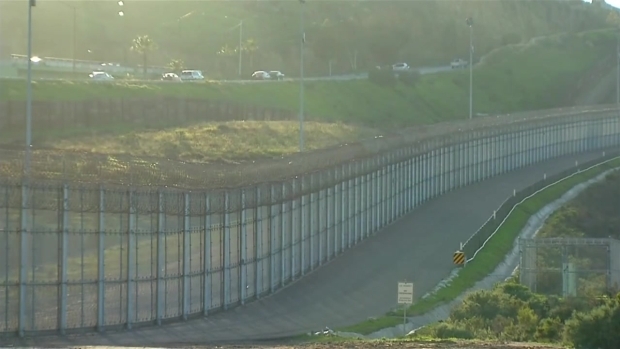 Bush signed the Secure Fence Act of 2006, which authorized the construction of 700 miles of a physical barrier along the border and resulted in pedestrian fences 18 feet high and other small fences intended to block vehicles. Of the more than 300 eminent cases brought in south Texas over those fences, 90 are still pending, Olivares said. The cases, which NPR documented in February, were given to one judge in Brownsville. Last week, as Trump's 100th day in office neared, his proposed wall stalled when the president backed off demanding funding in a federal spending bill needed to avert a government shutdown. But he insisted that the controversial project, embraced enthusiastically by his supporters while unpopular with many along the border, would go forward. "Don't let the fake media tell you that I have changed my position on the WALL," Trump tweeted last month as it emerged that he was no longer insisting that money be included in the bill. "It will get built and help stop drugs, human trafficking etc." The cost of a wall the length of the border — between 18 and 30 feet tall, two feet and extending six feet below the ground — would reach billions. Trump has said $10 billion or less, the Department of Homeland Security gave an estimate of as much as $21.6 billion and a technology magazine from the Massachusetts Institute of Technology, the MIT Technology Review, projected an higher price, from $27 billion to $40 billion for a 1,000-mile wall. Trump had proposed spending more than $2.6 billion to begin designing and constructing the wall, buy new security technology, hire additional Border Patrol agents and build detention facilities for undocumented immigrants. And in a sign of potential court battles to come, Trump wants money to hire 20 lawyers to obtain property on which to build the wall, much of it owned privately and subject to condemnation by the federal government. A poll released in April by the non-partisan Texas Lyceum, found that 27 percent of Texans ranked immigration or border security as the most important issue facing the state. But 61 percent opposed building a wall along the border and 58 percent disapproved of how Trump was handling the issue. In the past, Texas politicians have been strong proponents of property rights, and critical of the use of eminent domain. State Attorney General Ken Paxton, for example, sued the federal government under former President Barack Obama last year in a case involving contested land along the Red River. "Washington, D.C., needs to hear loud and clear that Texas will not stand for the federal government's infringement upon Texas land and the property rights of the people who live here," Paxton said then, according to the Dallas Morning News. If you build it, we may punish you. 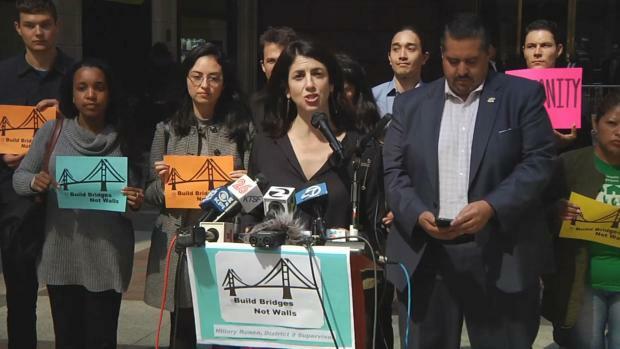 That's the message from San Francisco lawmakers to companies that are lining up to build President Donald Trump's border wall. Mark Matthews reports. But now Paxton and others are in favor of using eminent domain for the border wall. "It's a public purpose providing safety to people not only along the border, but to the entire nation,” he told the newspaper in an interview. Many other Texans, regardless of political leanings, are less enthusiastic. Olivares said the Texas Civil Rights Project opposed the wall as a symbol of hatred and a terrible waste of taxpayers' money. Palomino said he has seen people coming over the border fence in place now. "What's the sense of having a wall?" he asked. The South Texans' Property Rights Association is not against structure in strategic places if property owners are compensated well, said its executive director and a landowner, Susan Kibbe. But the association opposes a wall along the length of the Texas border for numerous reasons, among them the time it would take to build, the diminished trade that would result with Mexico, the country's third largest trading partner, and the money needed to construct it, which could otherwise go to Customs and Border Patrol, technology and equipment, detention facilities, the criminal justice system and programs to address the reasons people are fleeing Central America. From cartel retaliation to potential violent protests, border wall contractors want to make sure their staff is safe. NBC 7's Katia Lopez-Hodoyan explains. "Where it makes sense, then we're not opposed to it," Kibbe said. "It's just an all-out fence from Brownsville to El Paso that we just don't think that makes good sense." How much of the border would be walled is unclear. The Department of Homeland Security Secretary John Kelly told Bloomberg News on Thursday that a wall was unlikely in some places. A concrete wall would make sense in the southern Rio Grande Valley, while a large see-through fence would be appropriate elsewhere. And some terrain would be too rough, he said, citing the Big Bend National Park. "A physical barrier, as much as we can get in the right places, makes all the sense in the world," he said. Not to Palomino, a 48-year-old welder who said his house has lost value. "You've got to wake up to that wall behind you every day," he said. "It would be nice if they would just tear it all the way down to the ground."